The newest set of Magic the gathering is called Dominaria. It is an old setting in magic and it celebrates the 25 anniversary of the game. 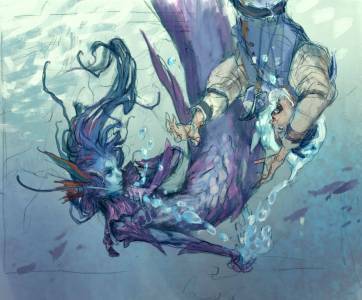 I was really excited to start working on the set and even more happy when I was asked to do a Merfolk Illustration. 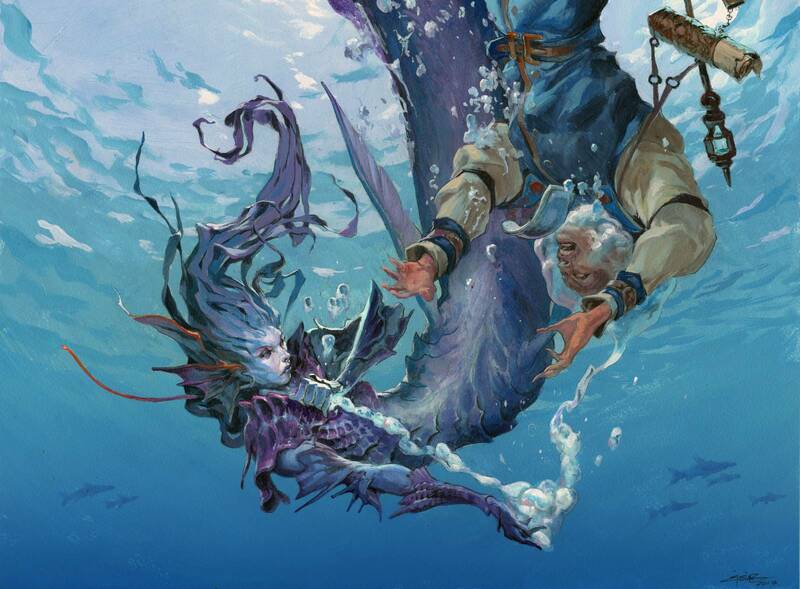 ( I play a Merfolk-themed deck a lot and am secretly even more happy when I get assigned to do cards that I can play with myself). 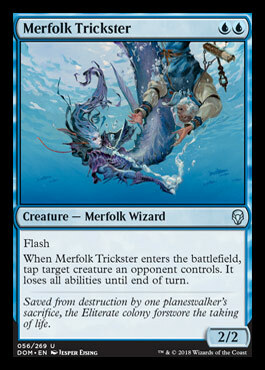 The description was really inspiring: A female Merfolk dragging down a wizard under water but in a chain of bubbles. She is not drowning him, but allows him to breathe in a big bubble around his head. She is only containing him for a while. I liked the idea that the wizard was able to breathe and would be able to see his predicament but with no way out. The last one in the second spread had most of what I liked. They were looking at each other, she was in front, the bubble rope was clear. 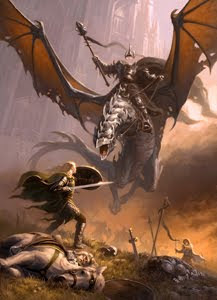 But she also seemed very much bigger than the wizard and if I was to make him bigger I would have the trouble again of who was the main character, especially with him facing us the spectator. So the first one in the bottom of the spread was the one where I knew I was on the right track . I Hope I am not the only one who can see what it is? 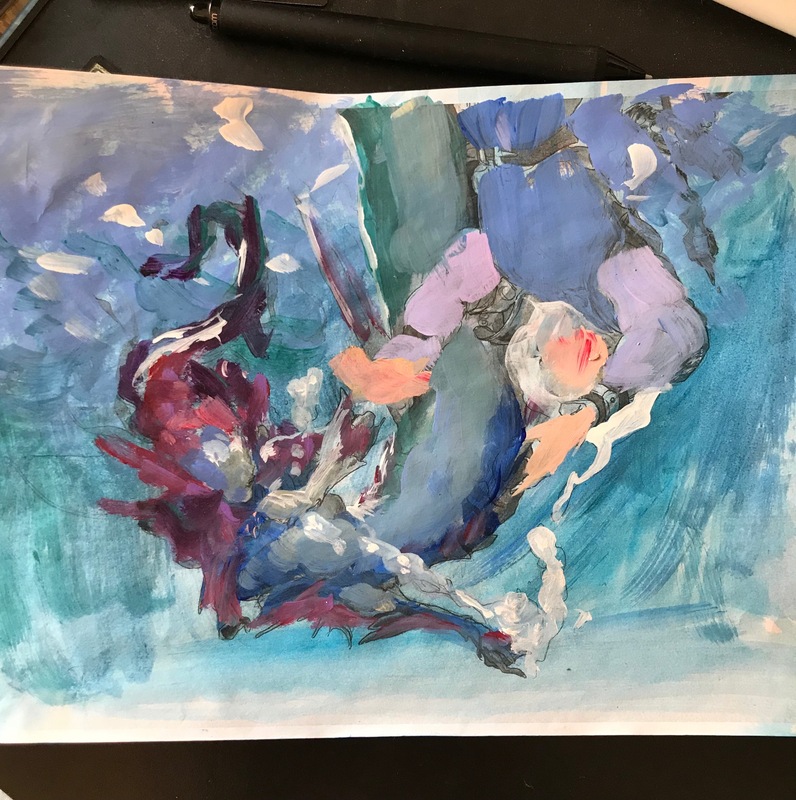 The wizard is turned upside down – so we know he is not the main character – she is more or less facing us, the pose showing the pull AND the bubble rope, and even if she is also upside down she would still be turning the torso as if she is twisting on her way up to the surface again. So this crude thumb sketch I turned into a real sketch. I did a small test on her face and the wizard before drawing it all out. After I was happy with the sketch I scanned it and added some colours and value for mood. Also I knew that I wanted the background to be bare open water close to the surface, as if to show that the capturing of the wizard had just took place and they only dived under seconds ago. As always I ink the whole drawing up on watercolour board and add grey tone for values. i print out a grey version and make a colour comp on top to get the light and colours right. I do not want to be forced to guess much when I start painting. The most important part here was that I wanted to see what it looked like to have the blue turn greener towards the bottom. So that the sunlight we see through the surface is more red and ultramarine and the rest is green/blue for deep water. The hardest part of this painting was that to make the light through the surface seem right, it had to be rough and alive: I could not sketch any of it. it had to be solved directly on the painting with a series of erratic strokes. So I printed out some photos of water and masked out the 2 figures with masking film. I put on some Coltrane and started painting: it is always interesting to peel away the masking film. You can never really see how it looks before you do that. 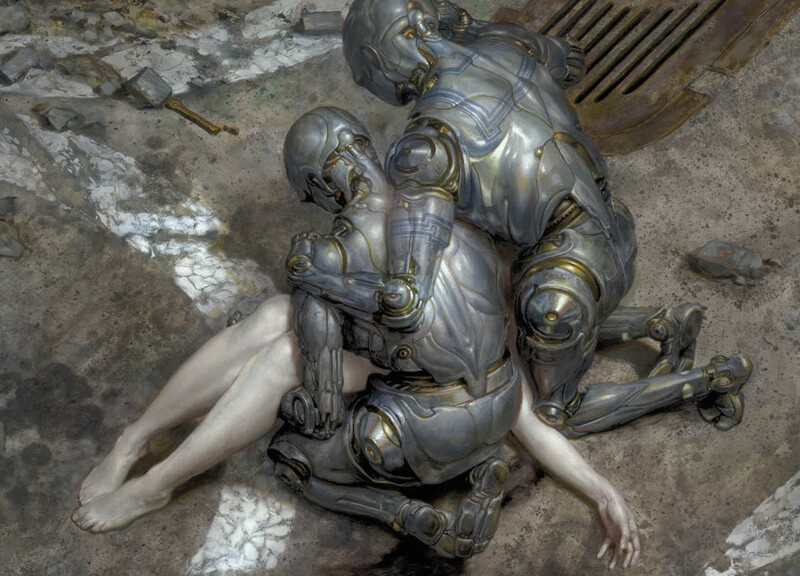 The figures are painted over and you just have to hope that there is no strange tangents or transitions that wont work. I kind of like how it turned out, the background. Everything is fluid enough and has no deep contrasts so it still feels very much alive while not drawing attention. After the background I painted the figures. And then i spend hours on trying to do bubbles. indeed it would have been easier to paint them digitally and to be able to move them around and make them transparent and all, but there we go. I want to make a pretty original. So I bit my tongue and painted bubbles straight on top of a final painting. It is always a thing you do with hesitation. 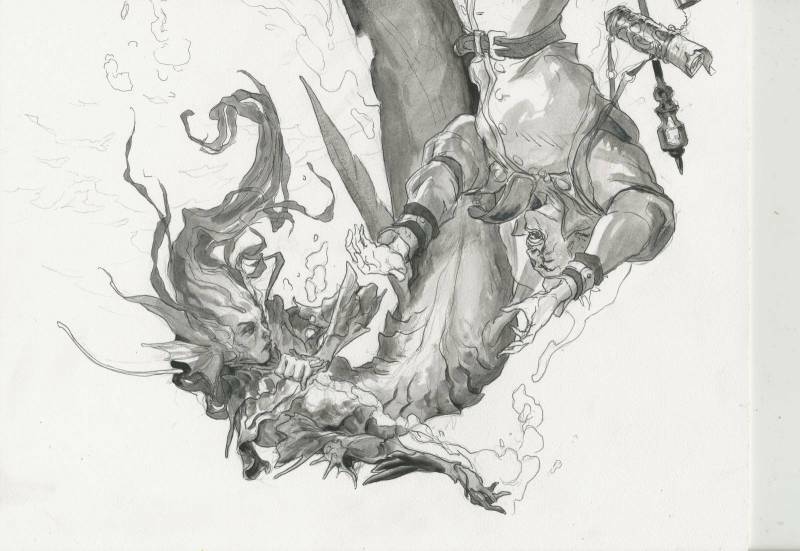 Jesper Ejsing was born in Denmark in1973. He first discovered fantasy through the works of Tolkien and got introduced to D&D on Christmas Day, 1986. Skipping through the pages of the rulebooks, he set a goal for the rest of his life: He would become a fantasy artist. He would make a living illustrating things that live only in imagination... one way or the other.He studied Danish literature and Art History before quitting University for a freelance artist life. 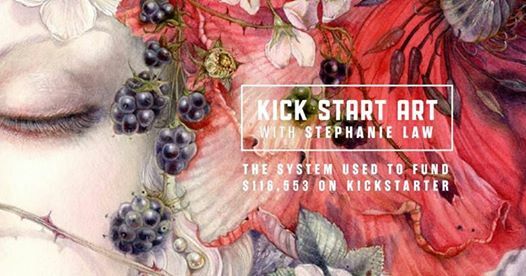 The early years as a fulltime illustrator meant drawing anything for money. 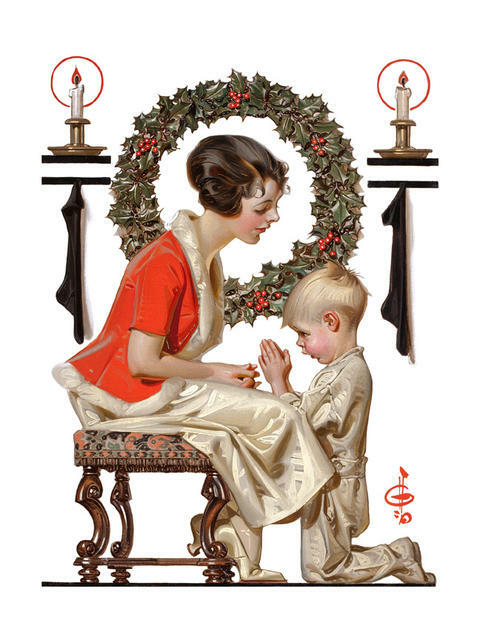 Soon he weeded out the assignments that weren't historical, and after a while all he did was fantasy art.When he finally got his first assignment for Dungeons and Dragons it was 20 years since that Christmas when the goal was set. 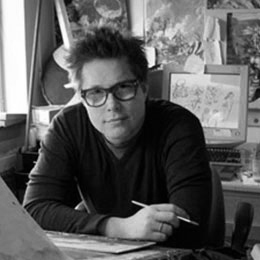 He struck out on a journey, stubbornly, and at times ignorant to the realities of life, and 2 decades of traveling has finally brought him home.Jesper Ejsing still lives in Copenhagen Denmark, with his 2 sons and wife, Lea. Along with paintings, he has written numerous books. "Jarvis – the Sorcerer's Apprentice" is the only one translated into English. Thanks for sharing this! I was really excited about this art when the card was shared a few days ago. One of the most stunning things about this piece I think IS the background/ surface of the water. Stellar work! Great work as always Jesper. I hope you get a free copy of the card for your deck once it’s printed! Awesome work! And a really nice and detailed description, thanks a lot! Looking through your process is always great and instructive to see from start to finish. Really enjoyed some of the other dynamics going on in the various drafts of the layout as well. all would have looked pretty awesome, keep um coming! I hope we can see a promo card with another variant of this art based on ur fisrts draws, i like a lot the bottom thumb of the first image, and the right thumb of the first image.